Adding a Paypal donation button to your blog will give your loyal readers a chance to support you by donating a few bucks.Its so simple to add to ur blog / site.Follow the simple steps to add a Paypal donate button. You Need to have/create a paypal account and then it should be validated by adding some credit or debit card to it (It’s Free). Provide the 4 digit code into the paypal account. Once you provide that the 1.95$ will be added back to your account. You can go thru the below process and get the Donate button. If you don’t have a paypal account yet, you can get a Free Paypal account here. First,Log in to your Paypal account. Click on the ‘Merchant Services’ tab (see at the top of the page). 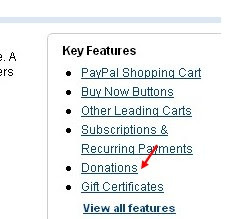 Scroll down the window and you will see an option “Donations” in the right sidebar.Click on it! now the donate button is not available for indians. paypal restricted indian citizens by addind donate button into their websites.